Cadiz Gallery is a new exhibition space located alongside the Deptford Creek, run by the music distribution company Cadiz Music. 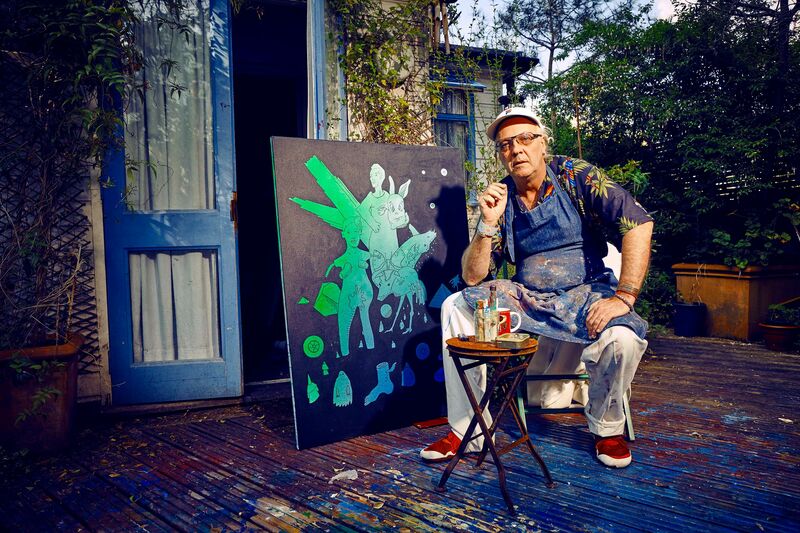 For its inaugural show, the gallery will present multimedia artworks by legendary musician and producer Youth. Born Martin Glover, Youth was an original member of the proto-industrial post-punk band Killing Joke until 1982. After founding the dub band Brilliant and the house duo Blue Pearl, he moved into production. Both with his own label Butterfly Records and working for others, he has produced acts as diverse as Art of Noise, Edywn Collins, James, The Orb, Pink Floyd and The Verve. Named Ouroboros after the ancient symbol of a serpent eating its own tale, the exhibition includes four large-scale paintings, films, a drone sound installation and a site-specific collection of found objects. Youth's art draws upon the history of psychedelia and abstract art, taking influence from the world's mystical and shamanistic experiences. You have adopted the ancient ouroboros, symbol of eternity and constancy, as the name for your new works. How does the name reverberate in the show? For me, the ouroboros symbolises the fountain of creativity and renewal, regeneration, sustainability. It’s the orphic voice – Orpheus was the Greek poet whose head, after it was chopped off, continued reciting poetry. The symbol suggests that you tap into that energy – it’s eternal, it's unchanging, it’s the timeless thing that you’re seeking, renewal in one’s own creative expression. There is also the idea of pop will eat itself, that it is consuming itself. The works examine eternity in the ordinary and the mundane through my expressionist and abstract paintings, long-stringed drone instruments and found objects. They are all recycled and regenerated. In the paintings themselves, the imagery is found, images that I have taken from books and recycled. The images are on top of each other like layers of an onion, like a snake eating itself, appropriating and regenerating. There is also an element of throwing the images down, in that moment, in augury. Could you describe your artistic process, and what the act of painting means to you? Painting is like a bit of sculpture – the thing itself becomes sculptural, in moving the paint. I’m quite a primitive artist in my method. I like to move the paint across with my fingers. It has a flesh-like quality, and of course oil paint was invented to paint flesh. For me, it is sensual and intimate, very personal. There are lots of different layers of process, I might begin with my ideas, and images I have already appropriated from somewhere else. I then project them onto canvas and paint out the negative space. I also take found wood from sheds and doors, to create the long-string drone instruments, and on them I have inscribed abstract words from my poetry. I attach guitar strings, create pickups and wire them to amps and I create the bridges from jam jars. I am taking found objects that have been thrown away and alchemising them into something new, something that makes a tone. There is always a link back to my poetry and music, they are different disciplines of the same process. They are primitive, but statements against consumerism: create and make it yourself. What would you consider the influences on your artworks? There are thousands. I do a lot of collage, drawing and illustration. I am influenced by Beardsley, Moebius, Max Ersnt, Pollock, Picasso, the surrealists, Dadaists, sculptors, futurists, the avant-garde of the ‘20s, German expressionists, the Americans, and Peter Doig more recently. Painting is easy to make relevant and valid as a medium. I’m also into the "post-painting" painters such as Warhol, De Kooning, painters that get a lot of energy into their work. Do you think your work in music has a bearing on your visual art? All the different works form each other in a different way, that’s part of the process. For example I’m on tour with Killing Joke and painting every other day. I have been showing and selling my paintings on the t-shirt stall every night; it’s a good way for me to paint like the way a band does a tour. You won’t find many painters that go on tour and it’s something I’ve been doing for years with Killing Joke. I am action painting in the moment, and at the time, I’m also painting from poetry books. Across the month long tour, I’ve painted nearly 100 paintings, creating 15 to 20 paintings in each sitting. The exhibition at Cadiz will also contain psychedelic films, a sound installation and a site specific object collection. How will this link to the paintings? They are another part of the process. I have created psychedelic films with ambient soundtracks. Some of the films have words across them. The music and visual elements have been combined with the films which are also very abstract and ambiguous. I filmed most of them on my phone and edited them with my assistant. The only thing I haven’t put in there is photography as I do a lot of photography. I have some exhibitions planned in the the US in the new year with my photography. Beyond the exhibition, what else do you have coming up? I finish the Killing Joke tour in Belgium and we head back home. I’m really excited about the opening at Cadiz Gallery, it’s my debut solo exhibition. I’ve done group exhibitions before, but it will be fantastic to open the gallery with my new Ouroboros show. There will be more music in the new year, and towards the end of the year my festival Puretone Resonate at my Space Mountain studio in Granada, Spain.